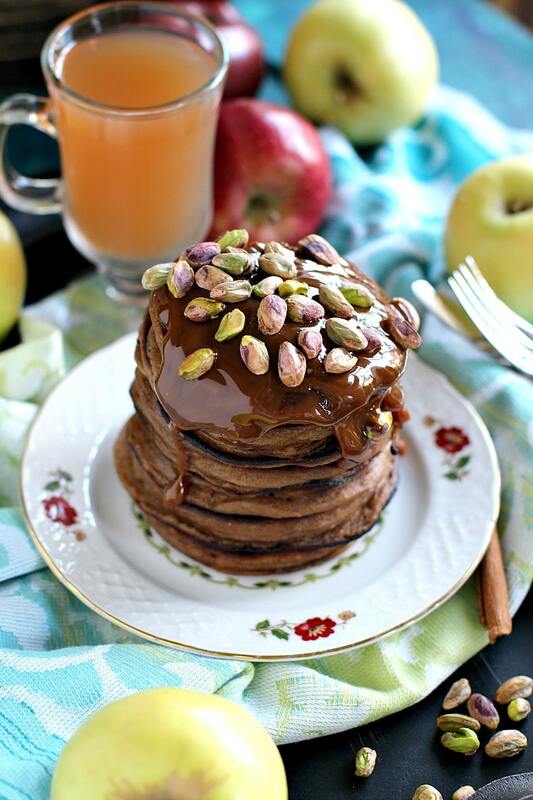 Apple Butter Pancakes with a beautiful cinnamon flavor are topped with apple butter, caramel sauce and salty pistachios. After making the Pumpkin Cheesecake Pancakes, I decided it would be a great idea to mix things up and do the pancakes with apple butter. 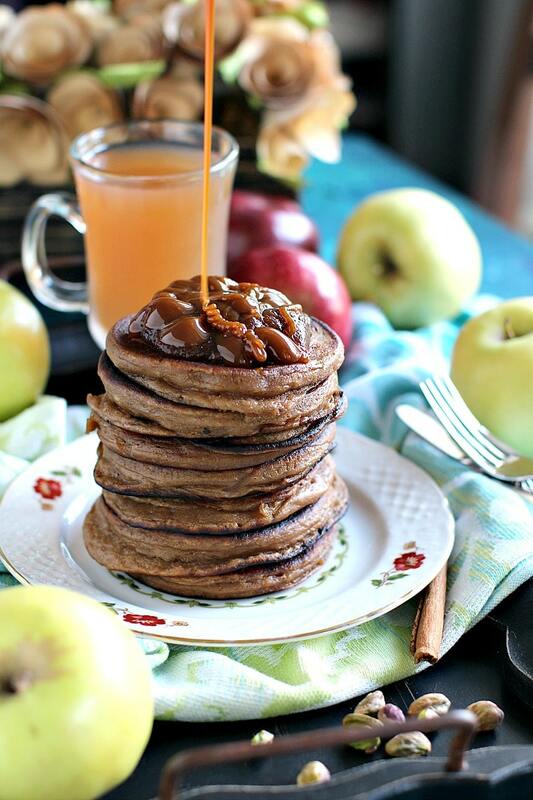 I made these Apple Butter Pancakes and you better try them as they are divine! Nothing like a good stack of pancakes to get you going on the weekend. I adore apple butter this time of the year. So making Apple Butter Pancakes to feed my obsession was a no brainier. These are not your regular fluffy, cake like pancakes. These are super dense, stick to your ribs pancakes, that will keep you full for hours. Also, the pancakes smell of cinnamon, and are topped with extra apple butter that is covered in a layer of warm, sticky caramel sauce. Topped with salty, crunchy pistachios that add a nice pop of color. Can you prepare pancake batter ahead of time? You can make the batter ahead of time and keep it in the refrigerator overnight. Stir again in the morning. If it has thickened, whisk in a few drops of milk to make it pourable. What makes pancakes fluffy: baking soda or baking powder? 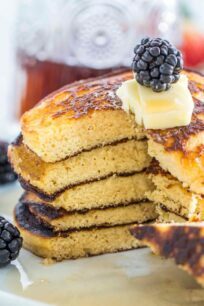 Even though pancakes are cooked on a griddle rather than baked, baking powder works the same way by making them light and fluffy. First, when you mixed together the wet and dry ingredients aim for “combined-lumpy”. This way you allow the gluten proteins to become loose and create air bubbles. 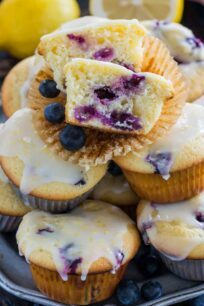 If you are not a fan of the lumps, try to smooth the batter with a whisk gently and slowly, not over-beating. Over-mixing the batter until very smooth, results in overdeveloped gluten. This leaves less space for fluffy air pockets. Also, if the batter is too thick, the pancakes may end up burned on the surface, and under cooked in the center. If the batter is too runny, the pancakes will spread out too much and become flat. 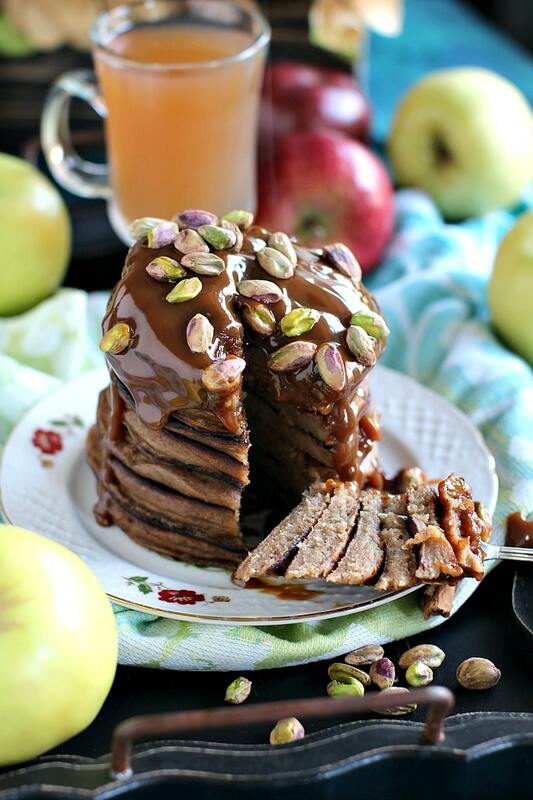 Dense and filling Apple Butter Pancakes with a beautiful cinnamon flavor are topped with apple butter, caramel sauce and salty pistachios. In a large bowl, whisk flour, baking powder, sugar, salt and cinnamon, set aside. Make a well into the dry mixture and add the wet ingredients: vanilla extract, egg, apple butter, kefir and milk. Use a whisk to mix until combined. Place a large skillet over medium heat, add butter and melt around to cover the pan. Once hot, start cooking the pancakes, ¼ cup per pancake. Turn the pancakes over when the edges start to look firm (about 1-2 minutes). Cook on the other side for another 1-2 minutes. Repeat with the rest of the pancake batter until all the pancakes are cooked. Add more butter to the skillet if needed. Stack on a plate and top with apple butter, warm caramel sauce and pistachios. i give so much attention to pumpkin…this year im trying my best to eat apples as well..and this recipe looks just heavenly. These are absolutely gorgeous! I can’t wait to give them a try!! I am thinking breakfast this weekend! Yum! Oh my word! Pistachio and Caramel together for the morning would be amazing. I would go crazy over this. We love pancakes, and these are perfect for fall weekends! 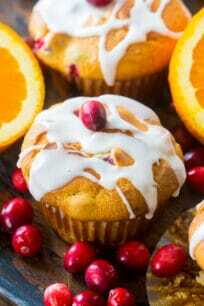 These make me want to run back to bed to wake up again for breakfast! They’re gorgeous, and love that flavor combo!